Wow! 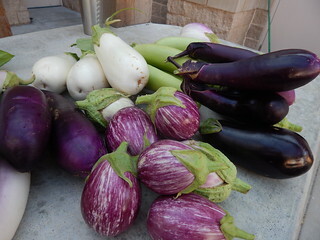 The eggplant and tomatoes are sure kicking it into high gear this week! 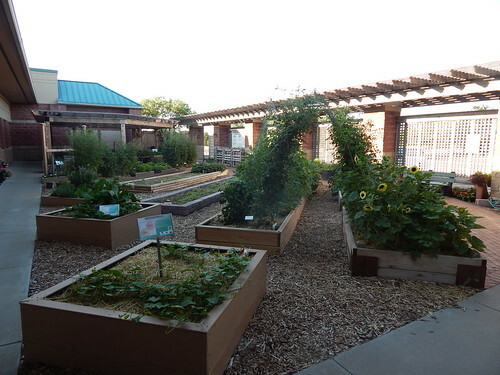 So are the spider mites and stinkbugs… Let’s take a tour of the garden! 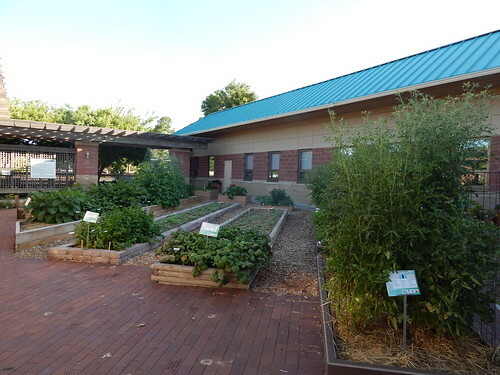 The top end of the garden is finally starting to look like something, with the sweet potatoes growing fast and the sunflowers and vegetable arbor also looking great. You can just see the green haze of the buckwheat. Here’s the view from the other end. I wasn’t going to show this picture because I’ve got so many this week, but I wanted you to have a better sense of just how crazy those tomato plants are getting. The one on the end is the ‘Limmony’ heirloom. The ‘Taxi’ tomato plant continues to produce like crazy. After a couple of larger initial fruit, they have settled down into very consistent 4-5 oz fruit, which is what they are supposed to be. No signs of cracking so far, but I picked a LOT of tomatoes this morning. We uncovered the squash in the Pizza Garden this week because it was starting to bust out from under the row cover. It had several broken leaves from being under a too-low row cover. It seems to be bouncing back just fine! 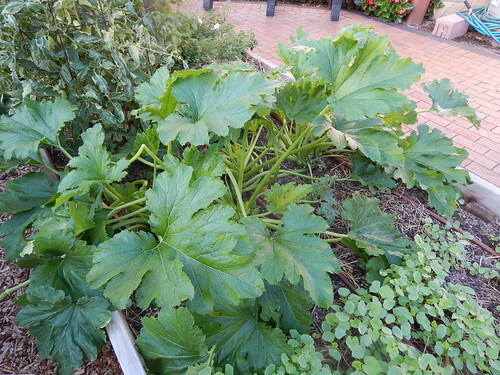 It also looks to have some buds starting, and so far there is no sign of squash vine borers. You’ll be proud of me though…I even took a few eggplant home with my to try a couple recipes. I made one last night – Alton Brown’s Eggplant Pasta (1 minute Eggplant Parmesan). Our conclusion? That the quick tomato cream sauce it was it was very tasty, but it was like eating strange pasta with a weird taste to it. It wasn’t disgusting or inedible – just – strange. We started discussing that we could make vegetable pasta out of zucchini and it would be better…or it would be quicker and easier to just make pasta. 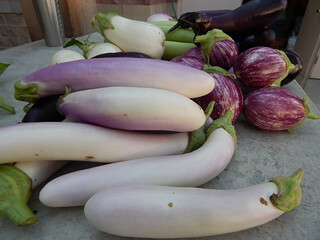 We’ll have to keep trying recipes, but I’m not hopeful about this eggplant experiment. The broccoli, cauliflower, and cabbage we started a couple weeks ago are looking good under my lights. 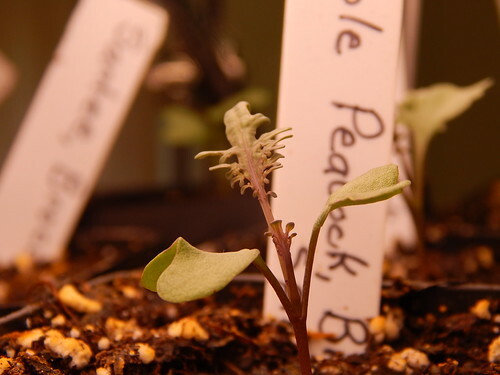 This is one of the ‘Purple Peacock’ Sprouting Broccoli seedlings. It already looks pretty cool, so I can’t wait to see it this fall! 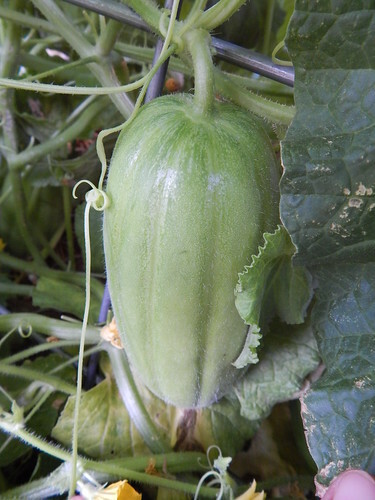 This is one of the developing Asian melons in the Vertical garden area. It is sizing up nicely, but is still pretty fuzzy and not starting to turn yet. It should be yellow and white striped at maturity. This is today’s tomato harvest. From a distance it looks pretty impressive. Up close it gets a little bit ugly with stinkbug damage, spider mite damage, and tomato spotted wilt virus. 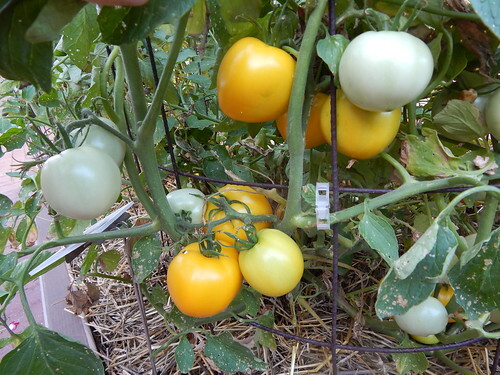 The yellow tomatoes and the cherry/grape tomatoes seem to be fine, but the poor red tomatoes! 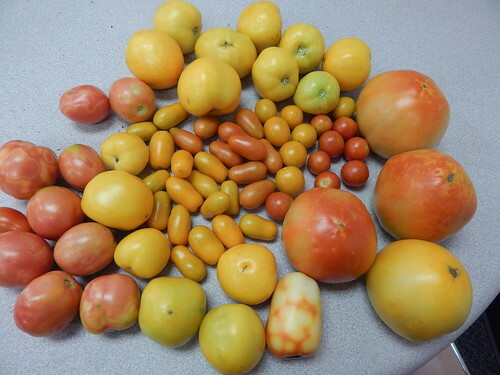 I’m really sad about the ‘Arkansas Traveler’ tomatoes because the plant is so loaded with fruit. I wish it were healthy so we were getting a good idea of the plant’s productivity and fruit size. The virus is most likely suppressing the fruit size. 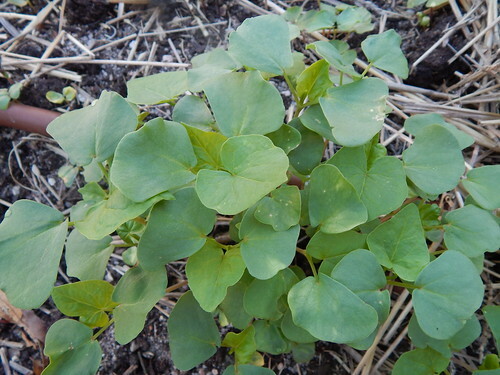 The buckwheat has grown, well, like a weed this week! It went from just sprouting to being 3-4″ tall in a week. It looks like we got pretty good coverage and germination. It will be growing for probably another week and a half or so before we turn part of it under to get ready for the next planting. Posted on July 19, 2013, in PhotoEssays and tagged broccoli, buckwheat, cover crops, diseases', eggplant, harvest, insect problems, melons, plant problems, squash, Tomatoes. Bookmark the permalink. Leave a comment.